Amal Clooney says she doesn’t see herself as a celebrity, despite her high-profile marriage to George Clooney. 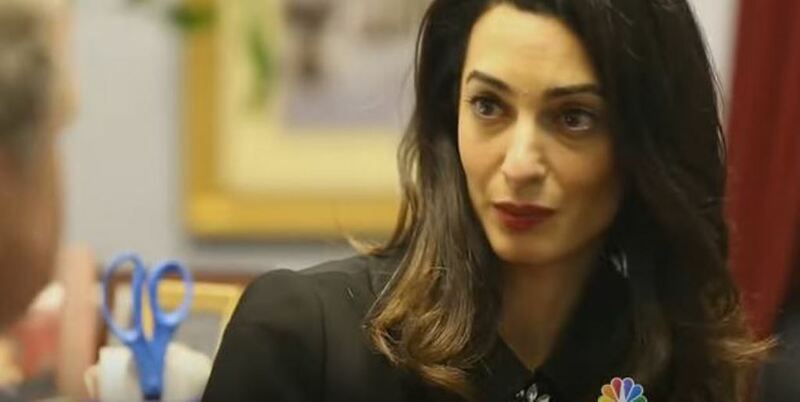 For her first American network television interview, Amal Clooney spoke with Cynthia McFadden this week in Washington, D.C., where the human rights lawyer met with Congressional officials to draw attention to the political crisis in the Maldives. A portion of the interview aired on Thursday’s “NBC Nightly News,” and additional clips will be featured on Friday’s “Today.” And while she largely discusses her work for the imprisoned former president Mohamed Nasheed, the activist also gives an interesting answer when compared to Angelina Jolie. She adds that she’s only “engaging with the media on issues that I think are important.” Check out both videos below. 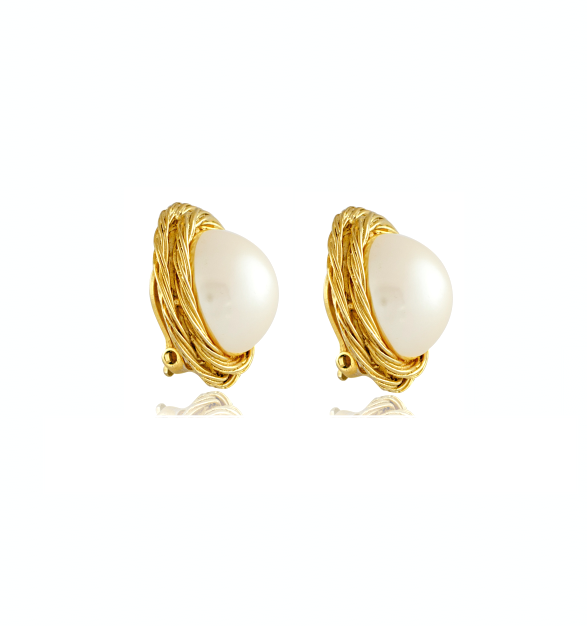 These Vintage Givenchy large pearl earrings with beautiful gold toned twisted detailing will quickly become the go-to earrings in your jewelry box. 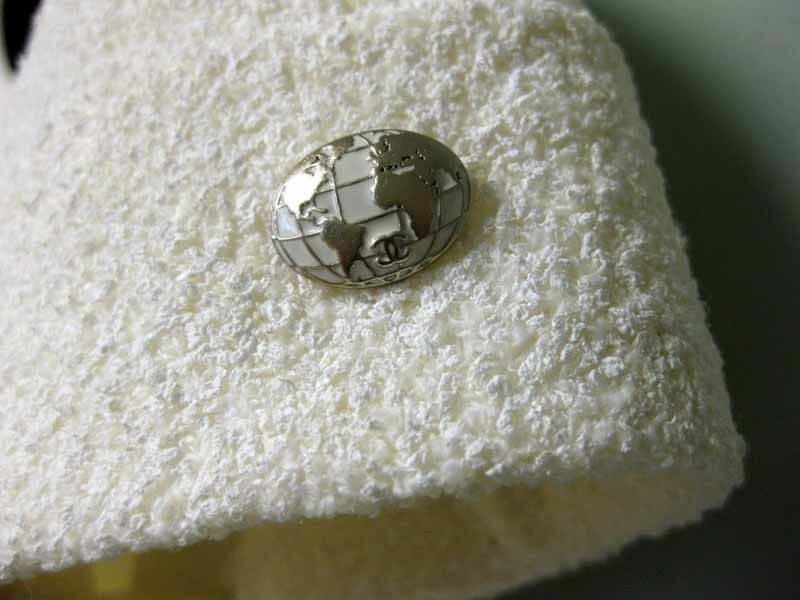 These earrings are stamped with the Givenchy logo as proof of authenticity. Amal is a lovely person doing great things, but she is getting alarmingly thin; scary scary thin. To the point that clothes do not necessarily look so good on her. Scary scary thin. Her sister, mother, brother(s), father are not this scary thin body type. She must be eating a piece of lettuce a day and no more. Yikes! I think she did a great job. Good for her. She also looked lovely doing it. Nice winter white dress. I loved the interview! Does anyone know where we can watch the new clips that were supposed to be released on the 15th? 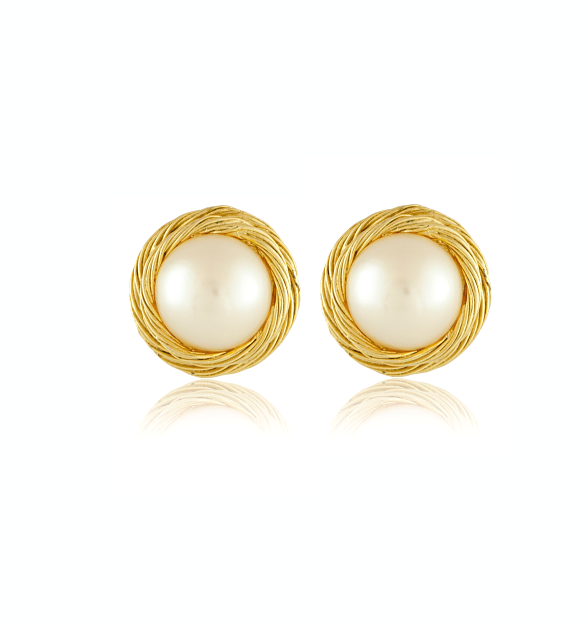 I have a question to the British commenters on this blog: Amal has a special accent and a very distinct way to speak, but I can´t classify it. Can someone tell me where it is coming from? I know the regional accents of British English show great variations – RP, BBC English, Cockney etc., perhaps her accent is due to her Lebanese family? Or is it a London accent? She has veneers which causes her to have a slight overbite. This in turn gives her a lisp which would account for the non-region specific British accent. It’s a standard middle class London accent in all respects, except she pronounces the letter ‘O’ oddly. ‘Hope’ becomes ‘Howpe’. That’s particular to her. It may be part of her ‘public’ voice – when individuals change their voices in order to sound more polished when speaking in public. The interview itself was somewhat without substance. Apparently the Maldives is undemocratic because of this coup and the U.S. should therefore impost sanctions on the country. It is a little strange to me that a human rights barrister is using her marriage to campaign on political, rather rhan legal, issues. And why she would meet with a state that still retains the death penalty. I also think it’s disingenuous of her to say she is still doing the same job she was doing before. She is not. She hasn’t brought a single case in a state where she has jurisdiction, under her own name, since her marriage. She is basically a non-practising barrister now who uses her new found fame to publicise cases which have a vaguely legal stance. That is not what she was doing before. A little more honesty about the fact that she did have to compromise her way of work for her marriage would be welcome. Dear ESR, after reading some posts of you I thought you to be a little bit jealousy. But I am quite sure to be wrong. Tarek, thanks for your answer, it makes sense. ESR, thank you for answering. Meanwhile I have done a bit web research about her accent, I read in all articles that she speaks POSH English … that is apparently not true. ESR, like you, I think the interview is without substance: The questions are shallow, Amal´s answers are not interesting. I am disappointed in Amal: She is more and more looking like a socialite (a person who is well known in fashionable society and is fond of social activities and entertainment) – clothes style, hair, make up, attitude and aura. While watching the video I had the impression of an actress playing very bad the role of a lawyer, or being a socialite married to a rich and famous man and appearing from time to time in the world of jurisprudence … because it is adding chic to her image. Of course I don´t know the real Amal personally, so I can just tell about my impression of her. She gives me also the impression, that she has not much intellect and a superficial dedication to her work (e.g. in comparison with her friend and colleague Jennifer Robinson), that is why she sounds boring and not convincing when speaking – again the picture of an actress playing very bad the role of a lawyer comes to my mind. I am surprised how much she has aged, despite a heavy make up and strong light she looks old and worn out. She was thin last year, but now she looks haggard, sickly thin as if seriously ill (video and pics); in comparison very thin models like Gisele Bundchen look healthy and less thin then Amal. In my opinion, Amal should start working seriously if she wants to become a really good lawyer – not only famous because of the name Clooney. But perhaps it is too late at 38? Also working long hours would not be compatible with her marriage. In the long run, I can ´t imagine her being credible as (world class) lawyer and getting many (good) cases since she is growingly distracted by her private life, which is certainly taking a toll on her, thus the worn out look. Personally I like best Amal in the role of Alice in Wonderland: jet-setting all over the world, plenty of chic events and balls, beautifully dressed, every day another chic expensive high fashion dress, happy smiling, always a feast for the eye … it makes me dreaming, I get inspired, her life seems so very fairytale-like and entertaining, an endless soap opera. And maybe it is the role that suits Amal best? The Bar is a frustrating profession for people who want to change the world. I wouldn’t question the extent to which she wants to “make a difference”, but I suspect Amal believes that she can make more of an impact by being a media personality campaigning for change, than having a career at the bar. I would disagree. I do not believe for one moment that barristers can really swan around UK courts saving the world, but I do believe that in certain cases one can have a very real impact on the lives of individuals and have an impact on British foreign policy abroad (something she seems to care about). But these are rare cases. A barrister has to work long and hard on many unfulfilling or commercial cases, before they get the odd case where they can say that they truly made a difference to another’s human rights or to government policy. That kind of dedication and work ethic is incompatible with Amal’s new lifestyle. So the option of genuinely practising law is not open to her. She has had to find another way to fulfil her passion – and we have no reason to doubt that her passion for human rights is equal to her passion for fashion – to change the world. Her new way is media influence. More than anything I just think she has made a realistic appraisal of her changed life, and decided she cannot continue working to the extent she did before, and so she has made a step change. I think it is understandable. My only qualm is that she should stop suggesting that her marriage hasn’t caused her to make heavy compromises in her working life. It is disingenuous. As to the reader who suggested I am jealous… I cannot say for certain what I would do in another’s shoes. But my instinct is that the thought of giving up the many years of education and hard work I put in to establishing the practice and reputation I have (as any barrister worth their salt has), to simply travel the world and campaign on single issues with no guarantee of success, and to endure a huge amount of media intrusion and scrutiny, is not a bargain I would strike. I love my job. I want to be better at it. I want to represent the client’s who put their trust in me to the best of my ability. And that requires commitment and dedication. My job rarely seems like work. It is constantly challenging, immensely fulfilling, and yes occasionally tiring or frustrating. But the feeling of walking out of court with a client who cannot stop shaking your hand is very special. Would I give that all away for the life she has now? I cannot say I would. She must love George very much, to give it all up. Or maybe her legal practice was not as successful or as fulfilling, and so the marriage was a fantastic opportunity to do other things. We cannot know for sure. Totally agree with ESR and Gaia. If you want a real human rights/public interest lawyer, who does actual hands on humanitarian work too – especially at the tough and dangerous end of womens’ rights and opposing sexual violence, and is married to a successful Hollywood figure but never uses his fame to further her career, look up Alexi Ashe. She’s the real deal, not a ‘Made in Hollywood’ caricature formed out of a junior lawyer with a great publicist and a married name. Her husband is Seth Meyers, but she kept her professional name as she’d done enough of note herself to earn respect sans the addition of Meyers. I think you could be a little less critical. I also had my questions about why they would want to go to US politicians for this case (in a comment in an earlier post that was not published) but if legally nothing can be done anymore or not quickly enough, then the only way to go is through politics, especially if this concerns a politician. Also, this interview in my opinion was just to show Amal as George Clooney’s internationally acclaimed human rights lawyer-wife at work and not so much focus on the case. And yes, she took the interview but maybe it was because they want to pressure the Maldives government as much as they can. I don’t think it’s always all about Amal. Remember that they only got Fahmy out of prison through a pardon of the president and not through a judgment. Inevitably her personal life affects her professional life and she tries to use it in a positive way, I think. I’m giving her the benefit of the doubt. I know a few lawyers in my country who seek the spotlight and they are still considered the very best by the public as well as their peers. But S, where does it end if the correct practise of Law, which this is now not, becomes firmly and inextricably tangled with matters such as politics, geo-political diplomacy, and a balance allowed to all/both sides? If only one party has access to the court of public opinion, and only that by association with Hollywood, yet still maintains they are acting in the capacity of/as a legitimate legal advocate (and not one capitalising on their access to media simply by marriage), how does that go any way towards fairness in outcome; either way? 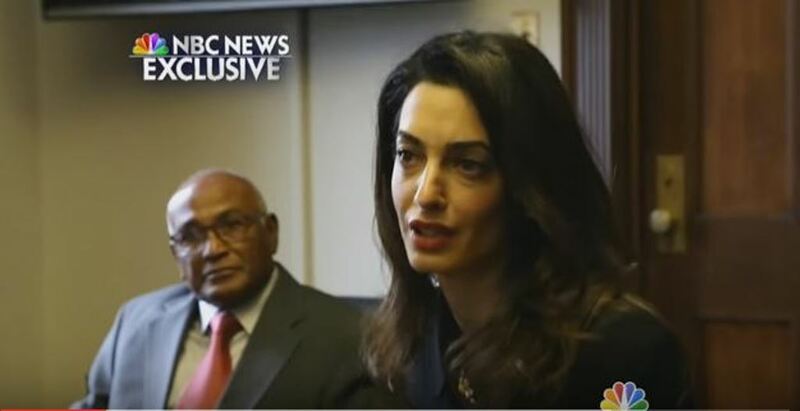 Amal Clooney claims Nasheed was convicted in a “show trial”, perhaps she is correct, although her client did admit to the initial ‘crime’ publicly. However, in what way does such become fairly or evenly-handedly redressed or determined to final outcome if Nahseed’s advocacy becomes, in effect, a Show Appeal to the international community? That is an aspect of Amal Clooney’s conduct which, whether for the correct ends or not, is causing concern for the legitmacy of the practise of this ‘style’ of celebrity lawyering. Taken to the Nth degree, are you not concerned that this merging of celebrity Lawyering and political diplomacy is actively seeking to circumvent necessary separations and walls placed in existence to ensure as fair and level a playing field as possible; irregardless of access to people of power or with media appeal? I believe this to be a point ESR has made, I further believe correctly, for some time; along with others, not least many of those also from the legal community in the UK, elsewhere in Europe, in UN circles, and within the US. It’s dangerous ‘Law’ to play fast and loose with necessary safeguards. In all cases Clooney lately she appears to wish to capitalise by shifting those boundaries and, mainly, for high profile clients already gifted with greater access as is. But downstream of such shifting lines the potential extrapolation and consequences are such that only with ‘star’ power can an individual or group get a hearing (however then one-sided). There’s issues for all with such precedent being set and embedded as ‘acceptable’. I very much agree with ESR and Truly’s points here. You both manage to put into words what I can’t (especially since I’m not a lawyer, but have a huge interest in human rights). @Lady ftr, I understand ESR is a lawyer and I respect her posts as having a great deal of merit for such; likewise other practising lawyers on the Board. However, as I would not wish to misrepresent or confuse, my initial background is in Politics, Philosophy, and Economics (PPE); more recently with focus mostly on Ethics. Past working for (and experience with) a number of third sector (voluntary/NGO) groups, and, at times, in partnership with governmental/legislative bodies, has given me some connexion in/with Law aspects on not dissimilar matters – UK, EU, UN etc so that’s the root of my blathering on. Anyhow, I didn’t want there to be any misapprehension that I post as an expert qualified in Law per se – I do not. Related, but not specific, is perhaps a way to put it. On a side note, I really do need to check for typos before I post. Apologies for missing words etc. @Truly: So that means that you are even better than a lawyer! 🙂 I’m a scientist, so my expertise is in an entirely different area. Anyway, I look forward to hearing more from you on here. Your expertise should be complementary to that of the lawyers on here. That was such a ‘lite’ interview. I thought NBC was (in American terms) a serious news station? I’m not meaning to be rude but examine the conversation and it’s really full of empty. Morna, NBC is an important news network. All due respect to Amal’s team, but it’s not critical & important to NBC, or the most important to them. In fact, it never even aired on Nightline Thursday evening. It got pushed out and was filled in with more important news in the USA. It appeared like Amal & her team wanted this interview & wanted it aired. All parties just appeased her, so it appears. She looked lovely, prepared on what she wanted to say, etcetera, but it wasn’t a highlight of news in view of the American public. The American public is more concerned about nationwide gun control, the upcoming presidential elections, economy, police behavior, the drug war on heroine, controlling borders to Mexico, and school shootings. Amal’s interview concerning the Maldives is the absolute least thing of importance on their mind. Right or wrong, they could really care less about the Maldives. To be frank. Amal doesn’t even live in America. Her primary residence is England. Thanks, Jaclyn. It came across pretty much as a paid-for advert in between the real news! I’m really perplexed about the manner in which this case is being is being publicised. Exactly, Jaclyn, which is why I think that the PR campaign – showing Nasheed’s legal team lobbying in D.C. and all of the interviews with Amal – is just a publicity stunt. It’s aimed at the Maldives government, if they bother venturing over to Youtube and U.S. media outlets. As far as the “court of public opinion” here in the U.S. goes: there is no such thing for this case here because it’s not a priority for the average American. In fact, I don’t think that the average American even knows who Amal Clooney is. I remember once bringing up her name with a group of women I know at work, one of which is Lebanese. Only the Lebanese woman recognized Amal’s name. From my point of view they want to get publicity for the Nasheed case. Nice professonally made interviews help to influence the public opinion. Just pr but well done. Thank you Jaclyn ! It made my day 🙂 I am trying to find it … but any success. Do you have a link ? Do you know anything about the nice camel coloured coat? Not yet … 😦 I posted the pearl earrings this morning. Wow Jackly ! You are awesome ! Nati, your blog was referenced on the extended interview which aired on Friday morning on ‘Today’. I think it was edited out, as it is no longer in the video below. If I’m remembering correctly it was at the start, around the 0:40 mark, just before “… It clearly wasn’t her looks or style that grabbed George Clooney’s attention”, that your blog was mentioned. This is the ‘ meet the press’ interview, aired this morning. Thank you so much Tack 🙂 I watched all videos, but I couldn’t find it. The “Meet the Press” interview is already posted here on the blog. 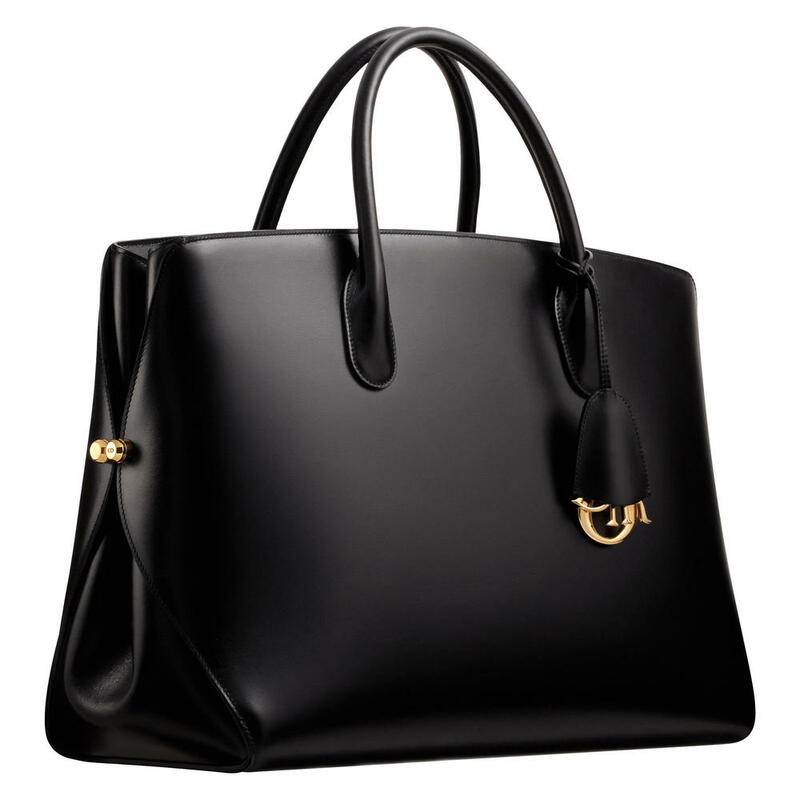 Do you know the brand and style of the black bag she is carrying in the NBC segment? Omg she is so confident and well spoken! I admire her greatly. Though its true I do not know how she can think properly while eating so little to stay so thin!! Dying to know what brand the camel coat is and is that her Dior bag? She is so classy. No wonder George is smitten. So Samba, you’re implying that ESR, one of the most balanced posters on this blog and seemingly a well educated and intelligent attorney in her own right, is to have her comments dismissed because you think she posts out of “jealousy” for lack of a marriage to a celeb? Is that the sum of and calibre of your argument? The logical conclusion to that tack is that, in the view of you as a fan of Amal, a woman lawyer only gains agency and right to an opinion if she seeks to marry an actor to further validate herself in public fora; yes/no? A bit regressive don’t you think, especially when apparently as used in defence of one such as Amal Clooney. Wow, Samba, that’s seriously offensive. Another extremely articulate and intelligent poster is to be upbriaded because – hang on – they’re not married to a celebrity???! If you can’ ten gag with ESR’s arguments, why start making personal attacks? ESR is always well reasoned and generally balanced in her views. She doesn’t have to be balanced – she’s not the BBC and this is an anonymous forum, but she always is. So all you can do is point out that because she doesn’t have a famous husband what she says is worthless? Talk about reducing women to totems. Are you suggesting that Amal only has worth because she married Clooney? Sorry for my English but I try to explain what I meant ironically. A hard working women should not be blamed for her private life. Whether she is married or not should not be important. AC has got much publicity because of her marriage and is able to fight for her clients and aims with additional means. She is not comparable to a hard working barrister because she can make political lobbying too. Great – for me, but other people may have other opinions. From my point of view ESR ‘s posts are definitely not balanced but I like to read them because they are interesting and I love the polished English. By the way: I don’t think me to be a fan of AC. I love her fashion style and how she fights for democracy and human rights is very Amal for me. I like it and wish much success. Nice day and peace @all! I have my tape set for Meet the Press this morning which airs @ 10:30 am EST. with Chuck Todd. 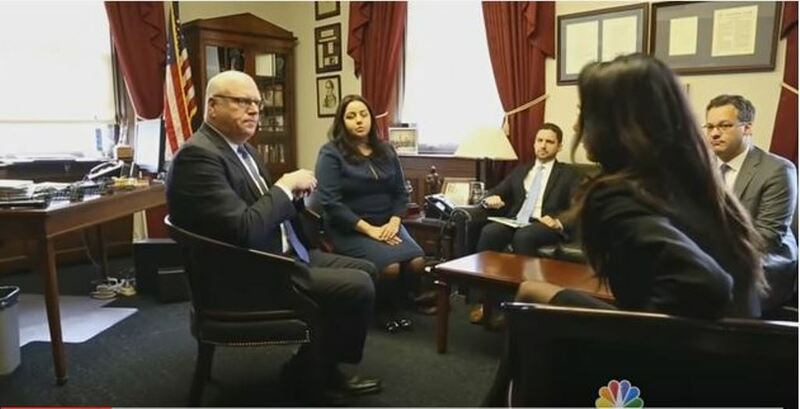 This is strictly a political show that airs for 30 minutes and it usually involves an interview(s), (in this case Amal), then a panel of political analysts who typically comment on the interview & topic. One of the earlier bloggers is possibly correct about this being “political” rather than a “legal” aspect. Given what I know about all of the channels she has been aired on….I think they are just being “polite” and “agreeable” to giving her air time. Nightline didn’t even air it. They replaced it with the Thursday night presidential debate highlights and also the death of Celine Dion’s husband. They will probably plug it in at another time. Gaia, I agree. I’m getting this sense of feeling, too. The “celebrity actress” kind of thing. Perhaps Amal should just work fervently behind the scenes, do her work, and stay off of TV. I think she will be more powerful. Speaking on TV and in front of a bunch of hungry journalists (like she did in the streets when defending the Canadian journalist) is not her forte. She should just do her work as she has always done. Her credibility is watering down every time she uses “celebrity-ism” to launch her view and when she thinks she can say, “American values are at stake”. Nothing could be more false. Amal has not done well if granting this interview. I think more time “out of the public” would have been more beneficial. Loved Amal in the interview…beautiful, confident and well spoken! Do you know what kind of tights she was wearing? Not for the moment. Perhaps Wolford. 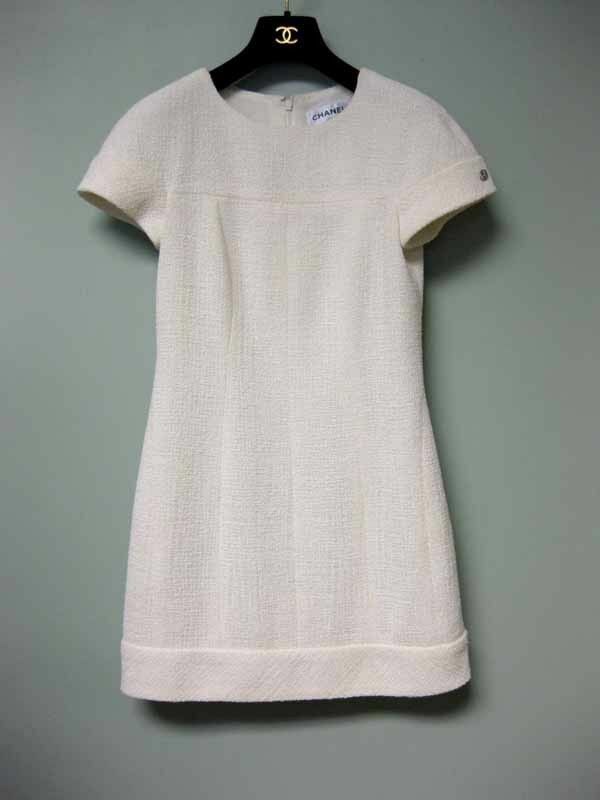 What about the wite dress? Any news? Dies Amal still speak “three” languages….? Them media has not mentioned this supposed asset anymore..just wondering. Yes, she speaks Arab, English and French. Thankyou for kind response are there any available interviews in French or Arabic? Couldn’t fine any. Is there any unknown reason Amal only relaeses interviews in English..? 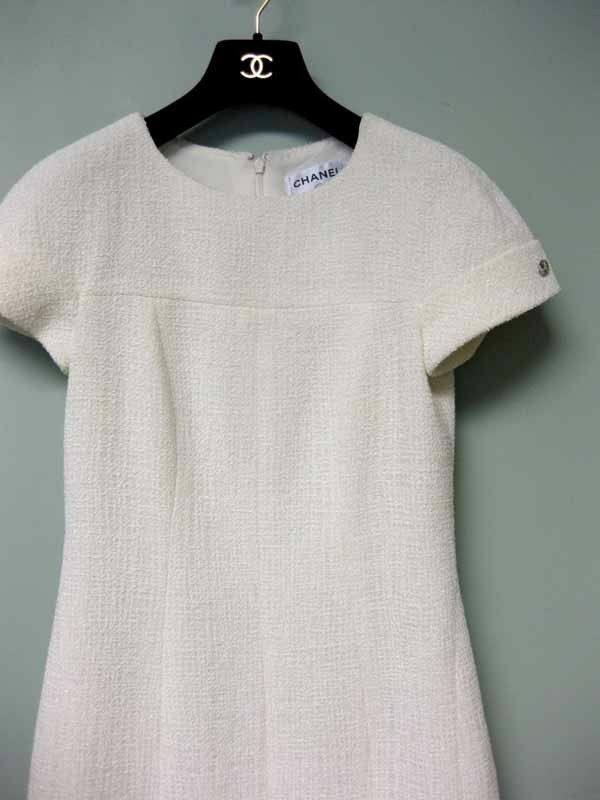 The dress is by Chanel.